Sedimentry Rocks - Learning Journey! - Made from sediment and/or by Chemical Reaction. Rocks are broken up into smaller pieces by wind,water and ice! These small pieces of rock turn into pebbles,gravel, sand and clay! begins to form flat layers. Over a long period of time,the pieces are getting pressed down together to then form sedimentary Rock,by either pressure or cementing.Most Sedimentary Rocks form under water! 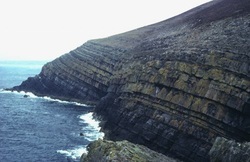 Sedimentary Rocks are commonly found all over the world, since about 70% of the Earth is covered by water! FUN FACT: Did you Know that 70% of all the rocks on Earth, are Sedimentary Rock! What is Sediment:Loose Material made up from plants,animals and bits of rock! What Is Compaction:When each layer of Sediment is squeezed together by the weight above it, this is called "Compaction". Cementation: A process in which pieces of sediment are held together by another material. Fossils: Fossils are evidence of once-living organisms.